Goodell Gets Booed at the Draft – What Does It Mean? RUSH: John in Indianapolis. Great that you waited, great to have you with us. How are you doing, sir? CALLER: I’m doing fantastic! Hey, you know that last phone call? You said you just had another 10 years, and I hope you do, especially when you said you were retiring in four. So, anyway, I think you have more than 26 million listeners a day. What’s your take on Goodell getting booed at the NFL Draft? RUSH: Now, see, that’s an interesting question. Let me ask you this. Roger Goodell. He goes out and announces the first round picks in the NFL draft, Roger Goodell. There were even stories in the sports media, “He knows he’s gonna get booed. Why would he do it? Why would the owners let him go out there?” In other words, “Wouldn’t you send somebody out there that’s gonna be applauded?” This is the NFL. They’re concerned about their brand. Why do they want to send the commissioner out to the draft in Philadelphia where the first thing people are gonna hear is the commissioner getting booed. Why? Do you think the commissioner did it? Why do you think Goodell did it? RUSH: Yeah, you want to know why he’s being booed. I’m asking you, he knew he was gonna get booed. Why did he go out there and get booed? He could have chosen not to get booed by not going out there. He could assign, you know, a Jay Z. He could assign who knows who to go out there and make these picks, and the crowd would have gone nuts. But he went out there and took the boos. Why did he do it? CALLER: Because he leads a bad organization, and I think that the NFL’s been going the wrong way for a long time. CALLER: I really it do. I think the NFL and the NBA have been tearing down coliseums and arenas and separating us and them via skyboxes, because when you go to a game as a normal guy, you just feel separated. RUSH: Wait a minute. But that’s not new. They’ve had skyboxes at NFL games for years, decades. CALLER: Well, okay. Let’s just talk about where I grew up. RUSH: But you’re right. You’re right. Why didn’t you feel the separation 20 years ago where today you do? RUSH: Well, no wonder you have a bad attitude about the NFL. You’re a Bengals fan. CALLER: I also went to see Walter Payton play in Soldier Field. Look at it now. It looks like a spaceship has landed in there. Why? ‘Cause of skyboxes. RUSH: (chuckling) Yeah. Yeah, yeah. Okay. You’re… This is interesting to me. So you’re looking Goodell being booed as a symbol of the problems the NFL has. RUSH: Right. That they seem to be ignoring. RUSH: Okay, look, thank you. Okay, since I now understand you I will tackle this in the monologue segment next hour. Make sure you stay tuned and don’t hang up. RUSH: No, no, no, no. I did not say that I was retiring in four years. The last caller… I never said I was retiring. All I did was extend my current partnership agreement for four years. Who said anything about retiring? I’ve never said that! RUSH: I’ll tell you what, if I did say I was retiring in four years, can you imagine what would happen? Oh, my, you can’t comprehend how big it would get. But I’m not. That’s not what I said. That last caller and his questions about Goodell… You see, my original interpretation of his call was wrong. He was happy Goodell got booed. He thinks Goodell should keep getting booed. He thinks the NFL is doing great damage to itself by… What’s the word? Bifurcating? It’s becoming a league of haves and have-nots, and they are continuing to exploit the have-nots for the benefit of the haves. It’s interesting. It’s almost a parallel argument to the way the Democrats talk about the Republican Party — everything they do is for the rich at the expense of the little guy — when it’s not true. But it’s just what they say. Now, I originally thought he was asking me about Goodell. Why do I think Goodell was booed at the draft last night? I don’t know if you saw this. I made a point to watch the first ten minutes of it just to say that I had watched it so I would have credibility. I watched Goodell walk out, and I knew he was again get booed. ‘Cause nobody pays to watch the commissioner. If the commissioner is willing to take the hit, if the commissioner is willing to absorb all of the anger — if he’s willing to go out there and make himself the pinata for everybody angry at the NFL to hit — then he’s earning his money because he’s taking it all. And in the process… If the league is gonna be criticized, if the business is gonna be ripped to shreds, and you’re an owner in the NFL, you would much rather have the commissioner be the target of it than the players. Because the players are what generate the revenue. The players is why people pay to watch the NFL. The players is why people buy jerseys and licensed merchandise. The players are the people you want to try to keep on a pedestal. The players are the people that you want to keep as much negativity away from as you can, which is why they’re so hell-bent on suspensions and getting the bad actors off the stage. I think Goodell going out there and taking the boos is strategic. Other people look at it… Like, I was watching these clowns on ESPN. “It’s very bad marketing. Holy moley! Why would Goodell go out there and do this? He knows he’s gonna get booed. Why would he subject himself?” Because better him than any of the players being drafted. What would…? If the first-round draft pick gets booed, that’s a disaster. You don’t want that. You want people idolizing these players. You want people thinking these players are gods in their own right in the world of athletics. You want everybody looking up to these guys as… (sigh) Not heroes; don’t misunderstand. But you want you don’t want any negativity attached to them, and they’re gonna do enough of that on their own anyway. They’re gonna get into enough trouble on their own. The more negativism the commissioner can absorb, the better it is for the league. Do you know where I learned this? I learned this when I was at the Kansas City Royals. There were a couple of potential player strikes during the five years I was there. I’m early thirties. I mean, I’m still young as I could be, and I’m a little bit still kind of groupie-like about actually getting a job there. I mean, I’m like every other normal American kid used to be. You grow up wanting to play Major League Baseball. Little League. Babe Ruth. You do all this stuff. You have these dreams of being a big leaguer someday. To get a job at a team, that was big, big deal. So I was still starry-eyed. And I remember… I don’t remember the specific event. It might have been related to a potential player strike or there might have been something specific going on. And I remember at lunch in the Stadium Club one day hearing the management of the team making the point that it was far preferable that somebody in management be taking the hit for whatever. The last thing they wanted was the players being the focus of the anger. And anything they could do to take the heat themselves, take the focus away from players in terms of anything negative, they would be happy to do, because the players the meal ticket, not individually, but collectively. The boos doubled and tripled in volume, all night long. He got booed all night long. But not a single player did, and not a single owner did. Nobody on a team got booed. So you can say that Goodell is absorbing all of it, and just because they hate a commissioner, even if they… I mean, if they really do. I think it’s kind of crazy to hate a commissioner anyway. But the media has generated that, so I’m sure some of it’s legit. But as long as you hate the commissioner, hating the commissioner does not mean you’re gonna stop watching the NFL. It doesn’t mean. If the commissioner’s hated… (interruption) Are you gonna become less of a Cowboys fan if the commissioners hated? (interruption) Hell, no. (interruption) Well, Goodell… Did he bring it on himself? Excuse me here just a second. I’ve been asked if Goodell brought all the booing on himself. Well, I guess. Are you talking about the Ray Rice situa…? (interruption) Oh, come on! No, no, no. Kaepernick? 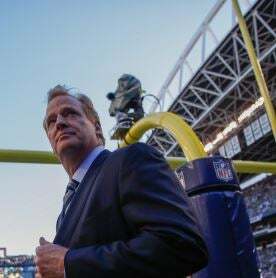 Do you think Goodell is hated and despised or being booed because of what he did or didn’t do with Kaepernick? (interruption) No, no, no, no, no. Goodell’s most recent… I can’t even remember everything, but the Ray Rice episode is what is the… Remember that, Ray Rice spousal abuse. Let’s not get into details. Don’t need to relive that. The original suspension was like 20 minutes, you know, six weeks or whatever. Then a new video was found, and so they had to suspend him for a year. Goodell got grief for trying to go easy on the guy, the first time around for not recognizing how serious it was. (impression) “He was trying to protect the player, proving the NFL doesn’t care about women! We don’t care about Pink October! Goodell hates women! You see what he didn’t do to Ray Rice ’cause of what Ray Rice…?” I thought that was the primary reason. I frankly think… (interruption) Deflate…? Oh! Oh! Yes, Deflategate. Well, I’ll tell you the truth about Deflategate. Right, there are people really ticked off because they think that Goodell unfairly… See, by the way, this disproves my just announced theory. In Deflategate, they literally targeted their marquee player, and they focused every bit of attention on destroying the reputation of their marquee player. Now, why would they do that? Snerdley’s answer, “To please the rest of the NFL fans.” You mean who think the Patriots are a bunch of cheaters? Well, this, of course, goes back not to Deflategate but to Spygate where it was discovered the Patriots were illegally videotaping and using during games evidence, steal signals, being able to predict what the opposing team was gonna do in real time, very much against the rules. And there was a $600,000 fine for spying on the opposition. Anyway, people thought the penalty was not nearly severe enough for the Patriots and Belichick, who got a huge fine, what was it, $600,000, that much? I’ll tell you what I think. This is why I should be on ESPN. By the way — I will not interrupt myself here. I think Deflategate was — and quote me all you want, but I don’t know anything. So don’t anybody call Goodell and say that Rush Limbaugh just told everybody what he knows, ’cause I don’t know. I’m just speculating here. Because, to me, this made no sense. This goes against every marketing principle on earth. You do not try to take the perfect reputation and image of a star player and tarnish it and destroy it, and that’s what they were doing. Now, some people think, “Well, but, Rush, but, Rush, they were deflating. Brady was doing it. Everybody knows it. He got rid of his cell phone.” Doesn’t matter. They went out of their way to cast Tom Brady and the Patriots in a negative — I couldn’t understand it. The NFL’s a TV show. Why in the world would you want to create, manufacture this kind of an image of one of your marquee players? And people said, “But, Rush, but, Rush, after doing this, they just made Brady that much bigger. They made Brady that much more a curiosity object.” Yeah, there has to be a reason for it, nevertheless. And I think — I know nothing, zilch, zero, nada. I think that a lot of owners in the NFL thought the Patriots got off too lightly on that Spygate thing. I think they believed that the Patriots have been engaging in a lot more than they got caught doing, and I think there was a cadre of owners demanding that Goodell play this Deflategate thing out as a means of seeing to it the Patriots finally got some punishment. That’s a wild guess on my part. I know nothing. And I’m a fan, so I can engage in speculation just like anybody else.